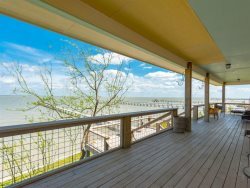 We offer a variety of vacation homes in Rockport, TX. Choose from bayfront, canal front, and off water homes in areas such as Key Allegro, Palm Harbor, Bahia Bay, City by the Sea, Copano Ridge, Copano Cove, Key Allegro, Holiday Beach, and Fulton. Many of our homes are featured on VRBO but can be only booked on our website! Laguana Reef Condominiums are newly remodeled and fully furnished waterfront condos located on Water St. near downtown Rockport. Amenities include a 1000 ft lighted fishing pier, swimming pool and hot tub, WIFI, large meeting room, and beautiful water views. ADDING CONDO LISTINGS SOON! Miss Kitty's Fishing Getaways offers off water vacation homes in Rockport Texas and the surrounding area. St. Charles Bay is an inlet of Aransas Bay and a prime location for fishing and birding. A public boat ramp offers easy access for boaters into the bay.